Climbing out of the valley north of Missoula, Montana, we encountered smoke. But it wasn’t until a few miles before the entrance to Glacier National Park that the nostrils began to burn and the air reeked of campfire. Attentive readers of my two most recent dispatches likely concluded fire was why my friend and I didn’t get far into the park. They would be correct. Before accepting our money, the ranger at the gates made sure we knew only three miles of park roads were open. “Yeah, but he came all the way from California and I came from Bozeman, so we figure we might as well check it out,” my friend replied. The shore of Lake McDonald was our first stop. At 10 miles long, more than a mile wide and 472 feet at its deepest, the normally picturesque glacial lake is a great spot for trout fishing, boating and picture-taking. A few kayaks and boats dotted the smoky lake. 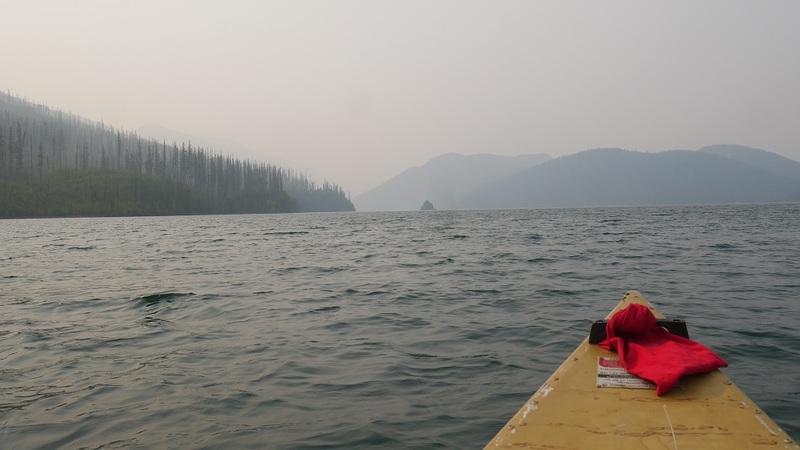 We considered taking our canoe out, but because the areas around the lake could be evacuated should the fire change directions we thought better of it. Instead, we took the also normally picturesque Going-to-the-Sun road to the end, which on that day was a roadblock just up the hill from the lake. On our way back we pulled into a turnout that I hoped would afford a good view of tree limbs damaged from a past fire interspersed with new green growth. A faded placard declared the scars of the fire evidence of important natural processes that help maintain the ecological balance of the forest. A weather-beaten van pulled into the small lot. A family filed out. The children wandered about. One kicked rocks. The father walked over, read the sign, looked up at the trees, back at the placard and silently returned to the van. Wife and children followed. They drove off down the hill. We bandied about the idea of going for a hike, then drove by hikers entering trailheads, their mouths covered to avoid breathing in too much smoke. We were again dissuaded. Instead, after scoping out an almost-smoke-free lake outside the park just a few miles away, we set off for the Hungry Horse Dam approximately 15 miles south. At 564 feet high, the dam on the South Fork Flathead River was the third largest and second highest concrete dam in the world when completed in 1953. 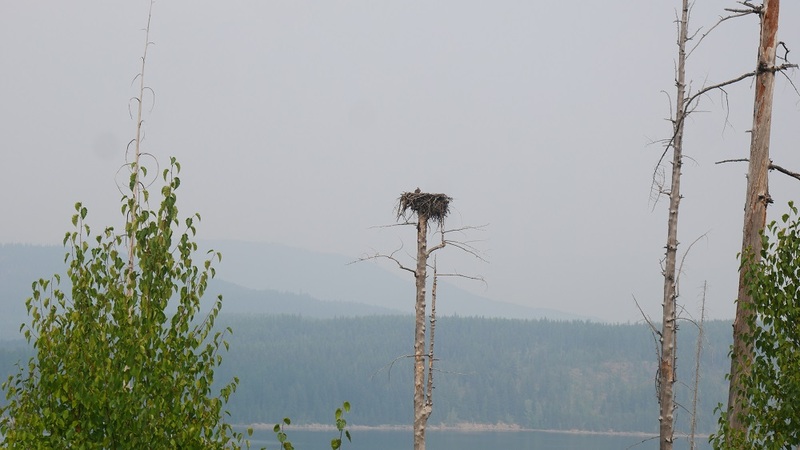 I was struck not by the dam, impressive though it is, but by the plethora of large bald eagle nests dotting the high trees on the edge of the reservoir. Determined to use the canoe she had schlepped hundreds of miles, my friend followed signs for the boat ramp while I stared at the nests. At the edge of a large parking lot sat a well-used travel trailer surrounded by a sea of colorful yard decorations. We checked out the ramp at the other end and were readying to park and unload the canoe to walk it down when a tiny woman with wild salt-and-pepper hair pulled up next to us in a small four-wheeler. This sprightly munchkin, who I concluded immediately belonged to the cheerful trailer, pointed us to a nearby dirt road, at the end of which she said we’d find a secluded spot to park and put in the canoe. And so we did, but not before I dropped the canoe on my friend’s foot and strapped a life vest onto an unimpressed Klaus the dog. Having never been on a boat, the confused and frightened old pup tried to leap out when I first placed him in the empty canoe. I had to resort to strapping his leash tightly to the boat while we finished preparations and pushed off. Once on the water he calmed down, eventually curling into a ball at my feet. The sun tried to shine through the smoke as we puttered past nest after nest on the calm lake that we had to ourselves. I thought of a reporter who had recommended I visit Glacier and also mentioned that some of the best parts of Montana lie outside the national park system. At that moment I couldn’t argue. While we hadn’t canoed on the famed lake in the park, we had here all I could have hoped for when planning the trip. 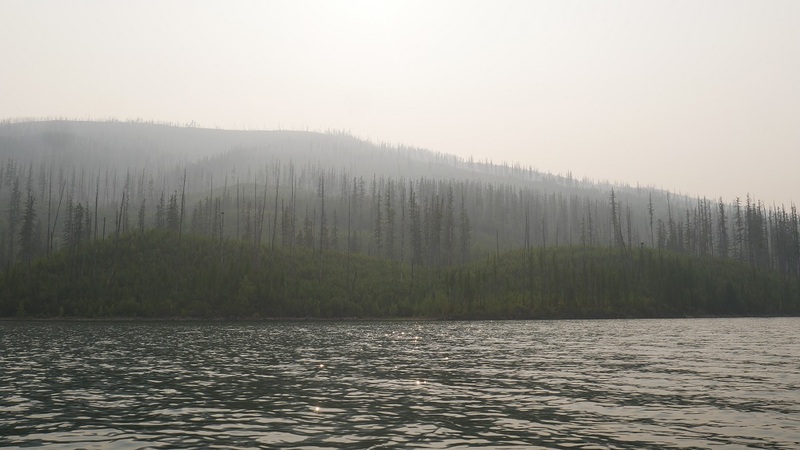 By the following morning the smoke in our campground had increased to the point of being almost unbearable. I overheard a firefighter checking into a cabin tell a young clerk the campground next to Lake McDonald was on high alert for evacuation, and that a different camping area had been closed the day before. 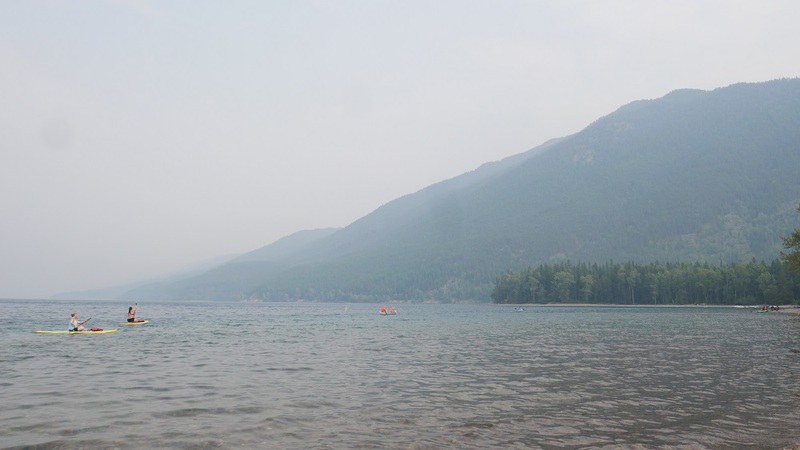 When my turn came I mentioned we planned on heading to nearby Whitefish for the day to try to escape the smoke. I asked if we were at risk of evacuation. The clerk assured me that though the wind was heading in our direction, the fire was still within the park boundaries on the other side of West Glacier. She lived on the edge of town closest to the park, and she wasn’t worried, she said. That and the fact the firefighters were using our campground as their headquarters put me at ease. His spot was empty by the time we headed out for the day. 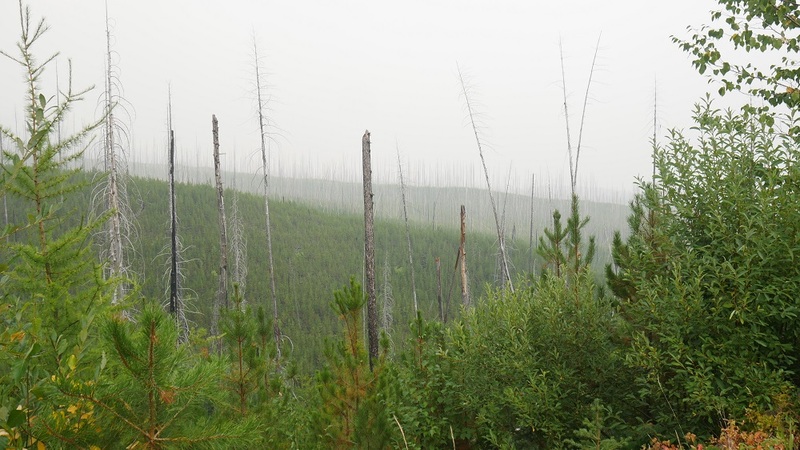 According to the Park Service, on average more than one fire rages in Glacier National Park every year. While they are dangerous, they are necessary. But if, like in California, we try to put out every fire that threatens a structure, we don’t let the fire clean out the forest floor which in turn feeds the next fire. By burning fossil fuels and felling forests we contribute to climate change, which in the West means more droughts, and in turn more vulnerable trees that can’t fight off pestilence like bark beetles, in turn creating more tinder, in a vicious cycle. Not lost on this bureau chief is that right now the people of Paradise, California, are returning to the charred remains of their homes, as did the people of Redding this past August, and Santa Rosa last year, and many other communities across the West that have been ravaged by fire. Others can’t return, their lives taken by the inferno. We cannot change the past, and we cannot expect people to move en masse from fire-prone areas. But we can reconsider how we interact with nature. Humans are able to alter their environment more than any other species, but we remain just one part of the ecosystem. We need to learn to live in balance with nature, which will endure, with or without us.